Finally, after spending hours on YouTube and audio clip sites, you have finally found an amazing audio byte that you think is perfect to make an awesome animated shot. You are excited. In your head this would be your "THE shot" to apply for jobs with. So excitedly you open Maya and start animating. But as you progress, your enthusiasm begins to fade away and you realize that even after laboring over this shot for days, it is nowhere as good as it should have been. It was perfect in your head, what went wrong? The answer is may be simple: you didn't plan your shot well. Pre-planning a shot is an important step that we 3D animators tend to forget. In our quest to jump into Maya and start blocking the shot, we leave a lot to our imagination. Things like camera angles, character position with respect to camera, storytelling poses and the character's thought process become a subject of whims and moods. The shot starts with a lot of energy, but then as we start questioning our acting choices, the shot begins to reflect our frustration. There are parts of it that work and parts of it that just don't. In other words, it is nothing like your imagined shot. "Shooting video reference is one of the most important tools at your disposal to add believability to your shot . " How? I am glad you asked. 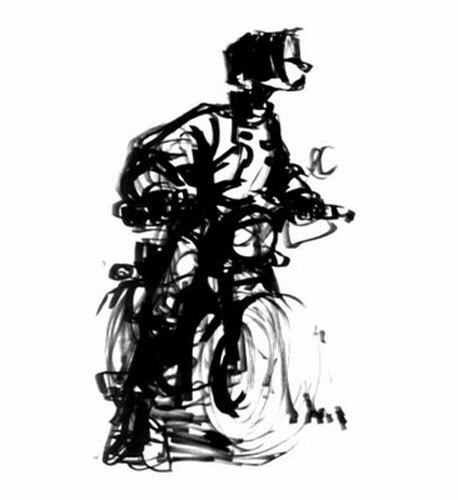 Video references help you to experiment with a lot of ideas. In this fast paced global world, having a good animated shot is not enough to get a job. You have to be a good storyteller and must have some good original or interesting story ideas. Usually it is said that after getting a dialogue shot, you need to understand the subtext of the scene and know where your character is coming from and where it's going to. Then you'll probably need to scratch the first three ideas for they likely will be cliched. For the rest of the ideas, experiment with them. With video camera on a tripod, start experimenting with the ideas, and see which one works best for you. Check the camera angles you think are interesting, and act standing in the character's position and move around to see how much freedom of movement you can have without compromising the clarity of poses and silhouette. In other words, this is your time to be loose and check all the ideas that you have for your story without making any serious commitment to any. Use props, be an alien-- heck, become a stranded pirate in desert. Everything is allowed. Hips certainly don't lie and neither does every other part of the body, especially in an animated shot. They have to work together to be believable. One tiny movement out of ordinary and every person will notice that. You can't take a risk there. So when you shoot a video reference, acting a shot out the way you want it to be, it helps you to study how the body moves from one pose to another. You then bring that knowledge to your poses and suddenly poses and transitions begin to work. There are many ways you can translate the body mechanics aspect of your video reference to your shot. One of the ways is to bring all the movements of the body into your poses. You might have to essentially block in 4's for that. Then get rid of the reference, and build on the existing body mechanics. With a strong body mechanics base, exaggerating poses and pushing them to the cartoony side becomes easier--without getting out of the realm of believability. Once you refine a pose in Maya, it becomes harder for you to kill it because you feel committed to it. You have spent hours on it and it is "perfect" so you become attached to it and try to keep it in your shot even at the expense of the storytelling. Shooting video reference and experimenting with acting choices are much easier and less time consuming. A general tip to follow is to go as non-traditional as possible. Bring in acting choices that are interesting to look at and are different from what anyone else is doing. Don't go too random, but try to bring in something that is unique to your shot. So if you are acting standing up, sit down. If you are sitting, try to move around. Will it be ok for your character to move his hands a lot or just use them only once? Every idea that you get, perform it and then perform the opposite of it. Within the parameter of your story idea and character's personality, test as much as possible. Figure out the beats, the motions and the poses. Go with the choices that get the point across as clearly as possible and still bring out the personality of the character you are going to animate. Try to work within the pose as much as you can. New animators tend to overact and move the character too much. Hitting a few strong storytelling poses and working within them results in much clearer and more appealing acting. Sometimes while shooting reference, our body subconsciously brings out movements that we never plan. Maybe it's subtle breathing, a certain way of moving hand, a micro eye-movement, or a subconscious gesture during one of the pauses: all these small actions bring the 3D rig into life. They make the whole shot seem very natural and effortless. 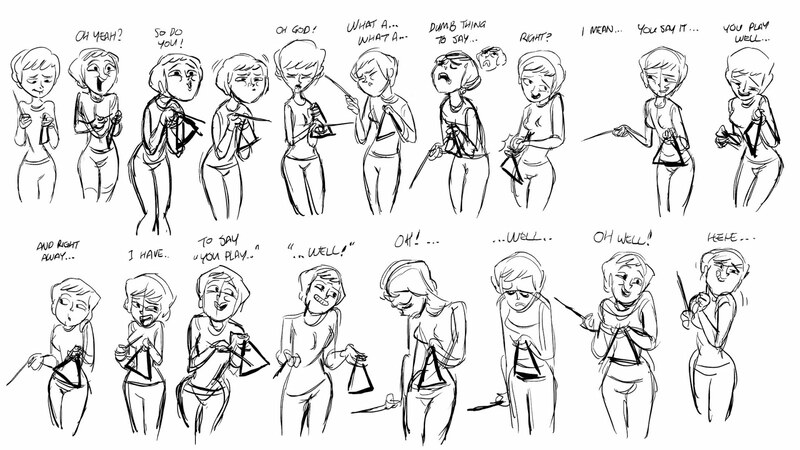 Without reference, you're not likely to get these moments no matter how good you are at animating characters. Having a deadline often makes the idea of ditching reference shooting plausible, but the truth is that this 2-3 hours of video shooting saves you from spending hours later in your shot. It is far better to open Maya with everything mapped out than "planning as you go". Never underestimate the power of pre-planning your shots. Experiment and have fun. So next time, don't skip the video reference step. There is no reason why it can't be fun. AnimSchool instructor and Disney Animator Tony Bonilla must have been having fun when he shot this video reference for one of his students. Enjoy! Join us at www.animschool.com to make great animation shots. "The role of the storyteller is to awaken the storyteller in others." “Storytelling is work. Pleasurable work, usually, but it is work." 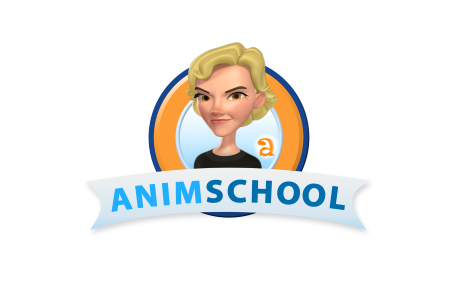 "Storytelling is the most powerful way to put ideas into the world"
Most of the terms at AnimSchool.com have a complimentary free Art class, teaching students painting, design, character development or drawing. In this video, Sean Sullivan, who worked as a background and Visual Development artist at Disney, talks about how Rule of Thirds can help you make better poses for your animation shot. Sometimes it's hard/awkward to speak up and ask questions in class (I know this all too well, as I am guilty of it myself). However, the instructors are there to help you learn and grow. They want you to ask questions so that they know how to teach you better and what to spend more time on. They won't know what you are struggling with unless you tell them. Knowing what the weakest part of your project is means knowing what you need to work on the most. Putting some extra time into these areas can push your work from good to great. At the same time though, it can also be a bit of an ego booster to know what your instructor thinks is your strongest area. It might seem awkward to ask, so you could reword it to something like, “Is there any part of this that you think is in a good place? Something that I shouldn't worry about as much anymore?” While critiques shouldn't be taken discouragingly, they can be hard at times when all of your project's flaws are being pointed out. The point of this question is not to get overconfident in your work, but to be encouraging and help you feel a little better about it. There are times when it seems like you might be on the right track but something just feels...off. From some angles or positions maybe it looks pretty good but from others it is kind of awkward and you are not sure why. Even if you and your instructor can't quite pinpoint what exactly might be wrong, it's good to at least point out the most awkward parts so that you can experiment in making them feel more natural. While this is the most popular question that actually does sometimes get asked during classes, it's also the one that gets the most passed up. I know it seems rude to interrupt, especially for an introvert, but if you don't, then most likely you will miss your chance to find out how something was done. Whether it's during a lecture, your own critique, or even someone else's, it's important that you always try to ask how to do something if you don't understand. No one will care that you are interrupting because, chances are, other students in your class were wondering the same thing but were too afraid to speak up. Most instructors will probably give you some guidance on where to look for helpful resources. However, just in case they forget or only went over it briefly, you should consider asking for more. They've probably been doing this longer than you and have therefore collected a goldmine of helpful websites, books, extra classes, and any other related resources you can think of. So don't be afraid to ask for these things because I guarantee they would be more than happy to share them with you. Okay so you've been critiqued, you know all of the things that need fixed, cleaned up, or improved. But…where do you start? Asking this question will give you a clear next step instead of a potentially overwhelming list of things that need done. Your instructor will probably have a good idea what he or she would do next, so why not find out? Just because your class is ending and you've turned in your project for final grading, doesn't mean you should stop working on it. Twelve weeks is not a lot of time to get a model/rig/shot 100% completed, even for professionals. There is always room for additions or improvements. In your final class, maybe during the one-on-ones, it's a good idea to find out what those things are. What can you do to push your work to stand out from all of the others that are looking to get the same jobs you will be applying for? I'm sure most instructors won't mind you emailing them for feedback after your class with them is over, but it is always nice to ask as this can create a relationship with them outside of class. One of the most important aspects of the animation industry is having connections. 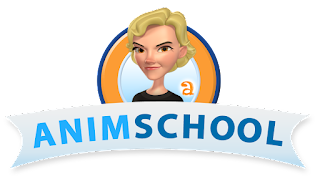 The more instructors you keep in touch with, the better your demo reel will be and the more professional connections you will have when job hunting. If you found these tips helpful and would like more blogs with advice about how to get the most out of your classes, critiques, etc, let us know either in the comments below or on the facebook post. In AnimSchool's 3D animation class for body acting, animation instructor Jeremy Lazare talks about adding texture and contrast to a shot in order to make it stand out. Unnecessary geometry can get in the way in the beginning stages and it's sometimes hard to go back once you get too much. The higher the subdivisions, the harder it is to make changes while blocking out the forms and proportions. It can make the surface unnecessarily complicated and lumpy. While the industry standard for model resolutions has gotten higher throughout the years, it's important to remember to start low. Often times you can make the same shapes with less polygons. But at the same time, don't let this scare you into not adding more topology as you progress. When you need more edge loops, you need more edge loops. The key is just to start low and slowly add more as needed. Clean geometry = a stronger and more functional model. It's easy to get caught up in the forms and ignore the topology. Just remember that every once in awhile it's important to clean things up. Make sure there aren't any stray vertices that are breaking the flow of the edge loops. Try to keep edge loops evenly spaced and quads as square as possible. Look at your model from all angles to find little bumps in the surface that need smoothed out. 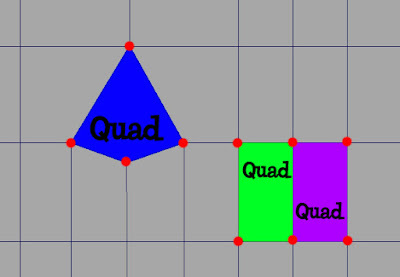 One of the first things you learn in the character program at AnimSchool is: quads good, triangles and ngons bad. 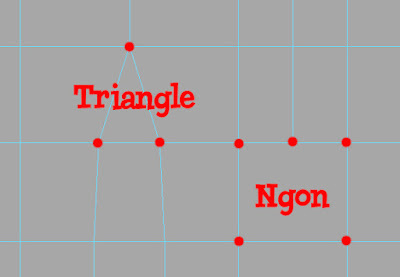 But what are triangles and ngons? 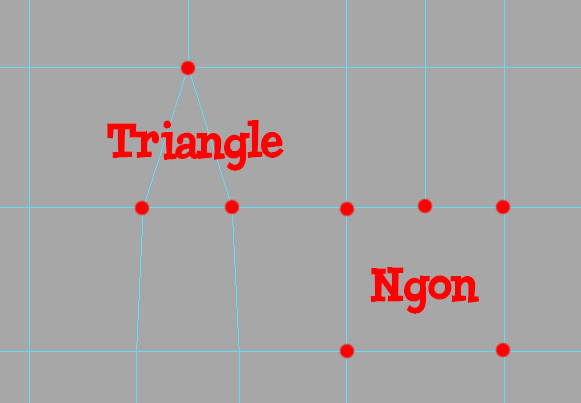 An ngon is a face or polygon that is made up of five or more edges connected by five or more vertices. Anything over a quad (4 sides) is considered an ngon. And of course, a triangle is a polygon with 3 sides. Why are these so bad you ask? There are several issues that they can cause but the biggest is that they can create odd and unwanted deformations when rigged to be animated. If a rigger finds tris or ngons in your model, it will immediately be sent back to you to fix them. They can also cause issues further down the pipeline when smoothing and rendering. Quads, however, are universal and generally play nicely with all aspects of the animation pipeline. Proportions are one of the most crucial things to get right in 3D modeling. Get them wrong, and it will throw off your entire model. You have to train your eyes to make comparisons and estimate depth. Of course, allowances can be made for style, and in the end, if you are working off of concept art, certain exaggerations would have to be allowed. Break the model down to the most basic shapes, that way you can easily adjust them according to the concept art. If you have multiple views of your object, then the use of image planes in orthographic views become very useful in judging proportion. However, try not to spend too much time in the orthographic views because it's more important that it looks right with perspective. Another trick is to open the concept art in an image viewer program (outside of Maya), line up the concept and model so that they are directly on top of each other (same size and angle), and then quickly flash back and forth between them. This can help you notice more differences in your model to more closely match the concept art. Modeling (like most things in the animation industry) is a balancing act between the technical and creative aspects. They are equally important for both appeal as well as functionality. It's easy to get hung up on one or the other for too long. One of the best ways to approach it is to think artistically and focus on the forms for awhile, then give yourself a break by just going through and doing a little clean up. In the end, what really matters is how closely the 3D model looks to the original concept art. Just remember to always keep the topology in mind while you are interpreting the art.